A virtual assistant can help your get your business up and running. Entrepreneurs start with a lofty dream. You're going to mix things up, change the business world as we know it. However, once you get started you begin to realize how many seemingly mundane, boring things you have to do to actually get the business up and running. There are a lot of administrative tasks a business requires that may keep you from making your dream come to life. Why deal with the daily drudgery when you could hire a virtual assistant? A virtual assistant is someone who takes cares of administrative duties for you remotely. They can reply to emails, do data entry, do website administrative work, and even handle your social media channels. Many of these people work on a contract or freelance basis, meaning you get to take advantage of the flexibility by only hiring them for as long as you need them. Are you still unsure of whether your business could benefit from a virtual assistant? Read on to learn more about what a virtual assistant can offer. Most entrepreneurs hate the lengthy meetings, drawn-out phone calls, and mundane emails piling up in their inboxes. It can easily take up a lot of your time, meaning you don’t have as much time to focus on your core business activities. A virtual assistant frees up your time, allowing you to do so. Virtual assistants are becoming more and more widespread and the field is becoming more competitive. As a result, many have developed other skills — social media management, marketing, copywriting, or maybe even basic accounting. If your business has yet to require full-time employees for these tasks, you may find that a virtual assistant is just what you need. Plus, you won’t have to think about tax, employee benefits, or yearly contracts. In the beginning, you’ll probably have your virtual assistant carry out simple duties — email management, customer service management, or bookkeeping. If they perform well, you’ll find that as time goes on, you’ll be able to entrust more complex and important duties to them, further freeing up your time to do other things. Chances are you started your business doing everything yourself, maybe with a person or two by your side. This is a great way to cut costs, but it also can be stressful and leave less time for long-term thinking. Having a virtual assistant take care of time-consuming but otherwise mundane tasks gives you time and energy to put some thought into where you want your business to go, and how you can take it there. 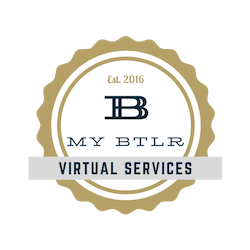 Ready to hire a virtual assistant? My BTLR can help. Contact us today to learn more about our USA based virtual assistants and how to get started.